TOKYO -- In sports, it's normally the adults who preach about sportsmanship and fair play, while it's up to the kids to absorb that information and hopefully take it to the field with them with an intent to do things the right way. But on Friday at the Tokyo Dome, the tables were turned, and the adults -- namely, the players on both sides of the diamond participating in the Japan All-Star Series -- were making a promise to the kids to, quite simply, behave themselves. "The symmetry, the full-circle moment of [how] they're trying to get where we are and now we're saying what they usually say to us," Phillies left fielder Rhys Hoskins said. "It was a really cool moment." Just before first pitch of Friday's 7-6 walk-off win by Samurai Japan over the MLB All-Stars, both teams took a "Players Oath," pledging integrity and sportsmanship. 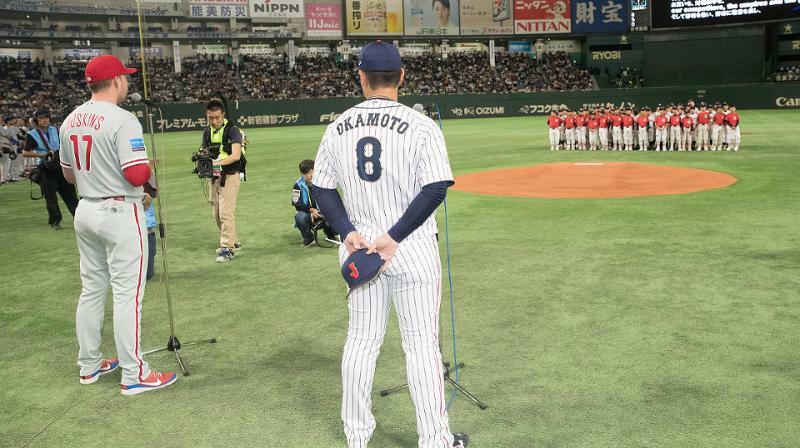 In front of a sold-out Tokyo Dome -- and more significantly, to 50 youth baseball participants who were invited onto the field to hear the pledge -- one representative from each team recited the pledge in his native language. "Today, we declare as a team and as individuals our dedication to fair play in all aspects of the game of baseball," Hoskins said, looking directly at the kids as he recited the words. "We promise to respect each other, our competitors, the umpires and the game itself. We'll promise to abide by the rules and give 100 percent effort to provide the best possible performance for the fans here tonight." This type of oath is not unusual in Japan. Every youth baseball tournament in this country begins with each participant first approaching attending adults and pledging to play with respect and fair play. The unusual part, of course, was that this time, it was the adults taking the oath. Major League Baseball, having made an unprecedented commitment to youth baseball in the past several years, saw the Japan series as a prime opportunity to present the first Players Oath to Japanese baseball fans who are used to hearing similar pledges, but only from the kids.